Copy of the Spanish Constitution displayed at the Palace of the Cortes. The Spanish Constitution of 1978 (Spanish: Constitución española de 1978) is the current supreme law of the Kingdom of Spain. It was enacted after the country's 1978 constitutional referendum and is a furtherance of the Spanish transition to democracy. The Spanish Constitution of 1978 was preceded by numerous other constitutions. The Constitution was originally ratified after a referendum on 6 December 1978 and was signed by King Juan Carlos on 27 December 1978. The signing of the Constitution marked the culmination of the Spanish transition to democracy after the death of the former Head of State, Francisco Franco, in 1975. This led to the country undergoing a series of political and historical changes that transformed the Francoist regime into a democratic state. The Constitution states that the King of Spain is the head of state. However, the king's function is merely symbolic and does not have any executive power. The separation of powers is implicitly stated throughout the Constitution, which says that all people have the right to decide the representatives who will occupy the Cortes Generales, consisting of the Congress of Deputies and the Senate; both share the legislative power. The Government, whose president is anointed by the Congress of Deputies, directs the executive power, and the judicial power relies on judges, and the Constitutional Court assures that all laws follow the Constitution. The constitutional history of Spain dates back to the Constitution of 1812. After the death of dictator Francisco Franco in 1975, a general election in 1977 convened the Constituent Cortes (the Spanish Parliament, in its capacity as a constitutional assembly) for the purpose of drafting and approving the constitution. A seven-member panel was selected among the elected members of the Cortes to work on a draft of the Constitution to be submitted to the body. These came to be known, as the media put it, as the padres de la Constitución or "fathers of the Constitution". These seven people were chosen to represent the wide (and often, deeply divided) political spectrum within the Spanish Parliament, while the leading role was given to then ruling party and now defunct Unión de Centro Democrático (UCD). Each of the Spanish parties had its recommendation to voters. The writer (and Senator by Royal appointment) Camilo José Cela later polished the draft Constitution's wording. However, since much of the consensus depended on keeping the wording ambiguous, few of Cela's proposed re-wordings were approved. One of those accepted was the substitution of the archaic gualda ("weld-colored") for the plain amarillo (yellow) in the description of the flag of Spain. The constitution was approved by the Cortes Generales on 31 October 1978, and by the Spanish people in a referendum on 6 December 1978. 88% of voters supported the new constitution. Finally, it was promulgated by King Juan Carlos on 27 December. It came into effect on 29 December, the day it was published in the Official Gazette. Constitution Day on 6 December has since been a national holiday in Spain. The Constitution recognizes the existence of nationalities and regions (Preliminary Title). Section 2. The Constitution is based on the indissoluble unity of the Spanish Nation, the common and indivisible homeland of all Spaniards; it recognizes and guarantees the right to self-government of the nationalities and regions of which it is composed and the solidarity among them all. As a result, Spain is now composed entirely of 17 Autonomous Communities and two autonomous cities with varying degrees of autonomy, to the extent that, even though the Constitution does not formally state that Spain is a federation (nor a unitary state), actual power shows, depending on the issue considered, widely varying grades of decentralization, ranging from the quasi-confederal status of tax management in Navarre and the Basque Country to the total centralization in airport management. Section 1. In the exercise of the right to self-government recognized in Article 2 of the Constitution, bordering provinces with common historic, cultural and economic characteristics, island territories and provinces with historic regional status may accede to self-government and form Autonomous Communities in conformity with the provisions contained in this Title and in the respective Statutes. Monument to the Constitution of 1978 in Madrid. The Spanish Constitution is one of the few Bill of Rights that has legal provisions for social rights, including the definition of Spain itself as a "Social and Democratic State, subject to the rule of law" (Sp. Estado social y democrático de derecho) in its preliminary title. However, those rights are not at the same level of protection as the individual rights contained in articles 14 to 28, since those social rights are considered in fact principles and directives of economic policy, but never full rights of the citizens to be claimed before a court or tribunal. Other constitutional provisions recognize the right to adequate housing, employment, social welfare provision, health protection and pensions. 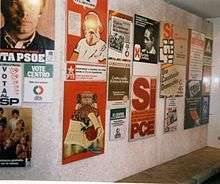 Thanks to the political influence of Santiago Carrillo of the Communist Party of Spain, and with the consensus of the other "fathers of the constitution", the right to State intervention in private companies in the public interest and the facilitation of access by workers to ownership of the means of production were also enshrined in the Constitution. The Constitution has been amended twice. The first time, Article 13.2, Title I was altered to extend to citizens of the European Union the right to active and passive suffrage (both voting rights and eligibility as candidates) in local elections. The second time, in August/September 2011, a balanced budget amendment and debt brake was added to Article 135. The current version restricts the death penalty to military courts during wartime, but the death penalty has since been removed from the Code of Military Justice and thus lost all relevance. Amnesty International has still requested an amendment to be made to the Constitution to abolish it firmly and explicitly in all cases. Amnesty International Spain, Oxfam Intermón and Greenpeace launched in 2015 a campaign to amend the article 53 so that it extends the same protection to economic, social and cultural rights as to other rights like life or freedom. After that, the campaign pleads for other 24 amendments protecting human rights, the environment and social justice. Title X of the Constitution establishes that the approval of a new constitution or the approval of any constitutional amendment affecting the Preliminary Title, or Section I of Chapter II of Title I (on Fundamental Rights and Public Liberties) or Title II (on the Crown), the so-called "protected provisions", are subject to a special process that requires (1) that two-thirds of each House approve the amendment, (2) that elections are called immediately thereafter, (3) that two-thirds of each new House approves the amendment, and (4) that the amendment is approved by the people in a referendum. Curiously, Title X does not include itself among the "protected provisions" and, therefore, it would be possible, at least in theory, to first amend Title X using the normal procedure to remove or reduce severity of the special requirements, and then change the formerly protected provisions. Even though such a procedure would not formally violate the law, it could be considered an attack on its spirit. The "Statutes of Autonomy" of the different regions are the second most important Spanish legal normatives when it comes to the political structure of the country. Because of that, the reform attempts of some of them have been either rejected or produced considerable controversy. The plan conducted by the Basque president Juan José Ibarretxe (known as Ibarretxe Plan) to reform the status of the Basque Country in the Spanish state was rejected by the Spanish Cortes, on the grounds (among others) that it amounted to an implicit reform of the Constitution. The People's Party attempted to reject the admission into the Cortes of the 2005 reform of the Autonomy Statute of Catalonia on the grounds that it should be dealt with as a constitutional reform rather than a mere statute reform because it allegedly contradicts the spirit of the Constitution in many points, especially the Statute's alleged breaches of the "solidarity between regions" principle enshrined by the Constitution. After failing to assemble the required majority to dismiss the text, the People's Party filed a claim of unconstitutionality against several dozen articles of the text before the Spanish Constitutional Court for them to be struck down. The amended Autonomy Statute of Catalonia has also been legally contested by the surrounding Autonomous Communities of Aragon, Balearic Islands and the Valencian Community on similar grounds as those of the PP, and others such as disputed cultural heritage. As of January 2008, the Constitutional Court of Spain has those alleged breaches and its actual compliance with the Constitution under judicial review. The amended version of the Catalan Statute prompts the State to allot investments in Catalonia according to Catalonia's own percentage contribution to the total Spanish GDP. The Autonomy Statute of Andalusia, a region that contributes less to Spain's GDP than the region of Catalonia contributes, requires it in turn to allocate state investments in proportion to its population (it is the largest Spanish Autonomous Community in terms of population). These requirements are legally binding, as they are enacted as part of Autonomy Statutes, which rank only below the Constitution itself. It is self-evident that, should all autonomous communities be allowed to establish their particular financing models upon the State, the total may add up to more than 100% and that would be inviable. Despite these changes having been proposed and approved by fellow members of the PSOE, former Finance Minister Pedro Solbes disagreed with this new trend of assigning state investment quotas to territories based on any given autonomous community custom requirement and has subsequently compared the task of planning the Spanish national budget to a sudoku. The Valencian statute, whose reform was one of the first to be enacted, includes the so-called Camps clause (named after the Valencian President Francisco Camps), which makes any powers assumed by other communities in its statutes automatically available to the Valencian Community. Autonomous communities such as Catalonia, Aragon, Andalusia or Extremadura, have included statutory clauses claiming exclusive powers over any river flowing through their territories. Nearby communities have filed complaints before the Spanish Constitutional Court on the grounds that no Community can exercise exclusive power over rivers that cross more than one Community, not even over the part flowing through its territory because its decisions affect other Communities, both downstream or upstream. ↑ Article 47 of the Spanish Constitution states: "All Spaniards have the right to enjoy decent and adequate housing. The public authorities shall promote the necessary conditions and establish appropriate standards in order to make this right effective, regulating land use in accordance with the general interest in order to prevent speculation. The community shall have a share in the benefits accruing from the town-planning policies of public bodies". ↑ Article 40 states: "The public authorities shall promote favourable conditions for social and economic progress and for a more equitable distribution of regional and personal income within the framework of a policy of economic stability. They shall in particular carry out a policy aimed at full employment." ↑ Article 41 states: "The public authorities shall maintain a public Social Security system for all citizens guaranteeing adequate social assistance and benefits in situations of hardship, especially in case of unemployment. Supplementary assistance and benefits shall be optional." ↑ Article 43 states: "The right to health protection is recognized. It is incumbent upon the public authorities to organize and watch over public health by means of preventive measures and the necessary benefits and services. The law shall establish the rights and duties of all in this respect." ↑ Article 50 states: "The public authorities shall guarantee, through adequate and periodically updated pensions, a sufficient income for citizens in old age. Likewise, and without prejudice to the obligations of the families, they shall promote their welfare through a system of social services that provides for their specific problems of health, housing, culture and leisure." ↑ Blinda tus derechos. Official campaign site.